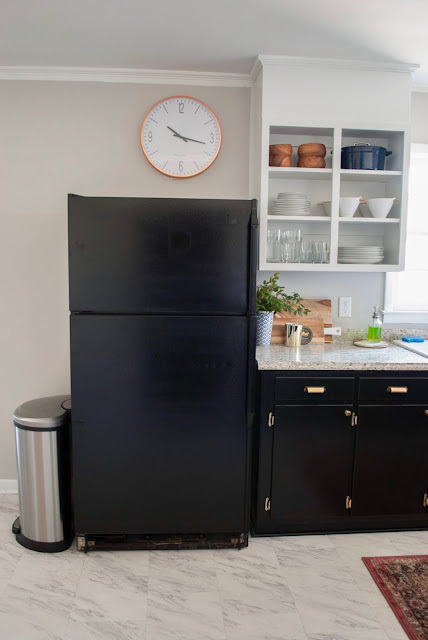 You might remember when we DIY'ed our fridge paint job when we moved in almost a year ago. It only cost $16 and transformed our old almond color into a not so ugle black one. 2 months later, that fridge died and we were on the hunt for another one. Luckily, my parents had just bought a house to renovate and it came with an old almond Whirlpool Mark I, the same model that had died. We spent another $16 on paint and basically we got another fridge for $16. I grabbed the spray paint and gave it the same treatment as the original. Today I wanted to answer all your questions and give you an update on it 10 months later. What kind of paint is it? We used Rustoleum's appliance epoxy. Normal paint tends to peel off with extreme temperatures, which isn't ideal for something like a fridge or stove. Epoxy paint is much thicker than normal paints making it more durable and giving it a longer life. It is also a spray paint which makes application easy and quick. Just make sure to grab a $7 comfort grip to save your fingers. How is it holing up? In one word, amazing. I only had to re-paint the top handle once because we scraped it against the door frame when we brought it inside. Other than that, we haven't had to do any retouching. It hasn't faded or peeled or shown any signs or wear. I even clean it weekly, which hasn't worn it down at all. It is almost like the fridge was made with the black paint. The epoxy is so hard and conforms to the texture of the outside most people don't even realize it was DIY'ed when they come over. Will it hold up to kids? We don't have kids who carry around sharp things or scratch their nails on it or throw things across the room, so we really can't speak to that question. Like anything I'm sure it would scratch if a sharp pen of fork were dragged across it but so far we haven't had any problems. 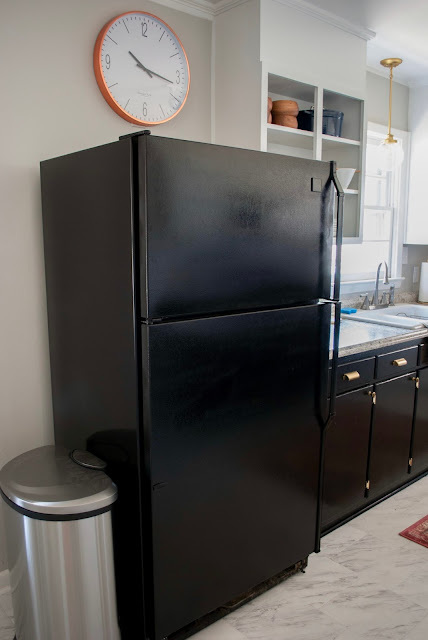 If you decide to paint your fridge and have kids let us know how it holds up! I imagine it performs just as well whether you have two people living in the house or four. Would you do it again? Absolutely! I would probably say it's one of the best projects we've done so far. It was cheap but really durable. It was quick but has lasted a long time. I loved the first one so much that we did the same paint job on the replacement. We probably won't have this fridge for 10 more years, but it has lasted us at least a year, giving us time to save up for the next one. And when your newlyweds isn't that all you can ask for? If you've tried this project or know someone who has make sure to leave us a comment and tell us how your's is holding up! I had also tried the same way to do the color change of some of the electronics to match them with the interior but after some time the paint started to tear apart.